I’ve been following the journey of a particular book called The Sweet Life from creation through to its final version. The book, which offers up gifts that originate deep within the ocean, is fascinating. It started years ago when a group of women were called to travel to various places around the world. They set up sacred stone circles in many places, and the sites can be visited by readers who want to experience the journey themselves. The book is now available on Amazon for those who want to hear from the very special beings who protect our planet and all humans on it. Guaranteed to be a deeply moving read, and perfect for book clubs. This entry was posted in Book Reviews, Book Sale, inspirational, mbs, Mind Body Spirit, motivational, New books, New releases, spiritual, Travel and tagged books, inspirational, mbs, metaphysical, Mind Body Spirit, motivational, New books, New releases, novel, reviews, spiritual, Travel, women on April 1, 2019 by Laine Cunningham. This entry was posted in Cash Prize, Contests, Grants and Awards, Literary Magazines, Paying Market and tagged authors, award for authors, cash award, Cash Prize, contest for authors, contest for writers, creative writing, essay, fiction, genre, horror, journal, journalism, literature, opinion, poem, poetry, sci-fi, writing, writing contest on March 6, 2019 by Laine Cunningham. Fantastic post about a must-see Netflix original covering the life of a woman who was important in history. 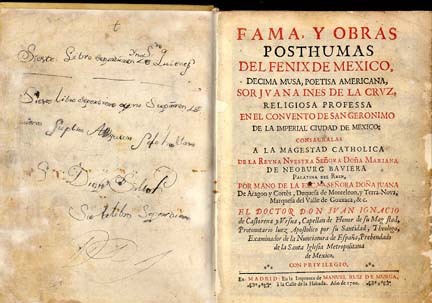 Frontispiece, Fama y Obras Póstumas del Fenix de México. Madrid, 1689. From Wikimedia Commons. This entry was posted in Uncategorized on February 11, 2019 by Laine Cunningham.